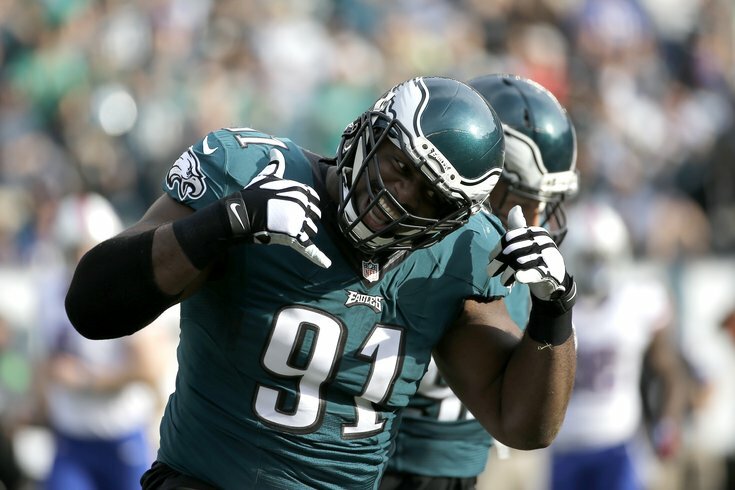 Fletcher Cox has to be happy with his spot in the first edition of #PhillyRank. There isn’t a ton going on in sports right now, so it’s probably a pretty good time to debut a feature that we hope will generate some conversation during this down time. #PhillyRank (which, if we’re being honest, is an idea ripped off from ESPN’s NBARank) is a highly subjective ranking of the best professional athletes (Eagles, Union, Flyers, Sixers, Phillies) in Philadelphia at the moment. 1. How did you perform last (or this) season? What have you done for me lately? There isn’t a lifetime achievement element to this. What type of form are you currently in? 2. What can we realistically expect from you next season? If you’re a promising rookie, it’s not a potential award either. Still, it’s safe to say that age and past performance play a factor here. In the case of the Eagles offensive tackles, the 26-year-old is definitely getting the nod over the 34-year-old. When it comes to a certain Flyers forward entering his prime, the track record is good enough to largely ignore a down year in 2015-16. The one rule is that to be eligible for the list, you need to have already suited up for a regular-season game in Philly. That means the likes of Ben Simmons, Joel Embiid, Ivan Provorov, Travis Konecny, Carson Wentz, Rodney McLeod, and J.P. Crawford can’t join the party yet. Our hope is to re-rank the players every six months or so, and it should be fun to include some of these names as we go. We felt like we had the Sixers covered pretty well. All of our friends submitted a player ranking of the team they focus on, and it was our job to throw them all together into one larger list. And while their input was highly valued, the final ranking is all ours. Don’t assume that the order for each team was the exact same one they sent. It would be cool if people completely agreed with these rankings. It would also be pretty cool if people vehemently disagreed with these rankings. Especially when we started comparing different sports, there is a high level of subjectivity here. It’s hard enough valuing a wide receiver against a defensive lineman, much less a second baseman. Covington battled injuries and took a step back after coming out of nowhere in 2014-15. We’re betting that with the addition Ben Simmons’ elite passing, Dario Saric’s playmaking, and veteran shooters stationed around him, RoCo will break out in 2016-17. The quality of his three-point looks should improve dramatically. Statistically, Neuvirth had the best season of his career in 29 regular-season starts for the Flyers in 2015-16. He then followed that up with a heroic performance in the playoffs. Neuvirth wants to be the team’s No. 1 next season, but in today’s NHL, a backup of his caliber is still very valuable. Bill Davis is no longer the Eagles defensive coordinator, which is good news for Curry. Now playing in Jim Schwartz’ 4-3 scheme, the New Jersey native is back playing his natural position and “the handcuffs are off.” Curry received a big five-year deal in the offseason, and he’ll undoubtedly play more than 35 percent of the snaps. Potential isn't supposed to be the main requirement for these rankings, but after the start Velasquez got off to in 2016, including a 16-strikeout, zero-walk shutout in which he allowed just three hits, the potential here is hard to ignore. The young righty, acquired from the Astros in the Ken Giles trade, could be a fast-riser in #PhillyRank, assuming he's able to avoid injuries like the one that caused him to miss a few starts last month. Eickhoff has worse numbers in more innings than Velasquez and doesn’t possess the same type of high-end stuff, but he also doesn’t carry the same type of injury risk. The 26-year-old was viewed as a throw-in in last year’s Cole Hamels trade, but he has showcased an impressive repertoire of pitches since being called up. There’s some more upside here, too. The sample size on Hicks is relatively small, but we aren't going to hold a season-ending injury against the rookie linebacker (so long as they don't become a recurring issue), especially when you consider what he was able to accomplish in just five starts. And if we're going to have guys like Eickhoff and Velasquez -- as well as others that are even higher on the list -- in the top 25, Hicks deserves a spot as well. The Union currently sit in second place in the Eastern Conference, and Blake is among the MLS’ best keepers at only 25 years old. The net has recently been a trouble spot for the Union, but Blake has taken control with a 1.33 goals against average. Last month, Blake was in goal for Jamaica during the Copa America. Peters is the old head in this list dominated by youth. Not only is he the only player over 30, but he's six years older than the next player. In his prime, the veteran tackle would have been a no-brainer for No. 1 in #PhillyRank. And despite battling injuries last year, Peters was still an above-average offensive tackle. Unfortunately, there's no Fountain of Youth at the NovaCare Complex, so Peters may not be long for this list. Okafor is the first Sixers center on #PhillyRank who might not be here by the time the season rolls around, and his value is a controversial topic among Sixers fans. His rookie year didn’t go as planned on or off the court and there are major questions about his defense (and that is why he’s behind Nerlens Noel). Still, Okafor has a unique low-post game and he did become a very efficient scorer as the year went on. Through his first 12 starts of 2016, Nola looked as though he was picking up right where he left off in his rookie season. The righty from LSU backed up a 3.59 ERA from 2015 with a 2.65 ERA in his first dozen outings this season. Then something went wrong, and over his next five starts, Nola allowed 27 earned runs in 18 innings (13.50 ERA) and only managed to pitch past the fourth inning once. Depending on how he responds to an extended All-Star break, Nola could find himself in a very different spot by the time the next #PhillyRank list comes out. With the rest of the team in Las Vegas, Noel was at least still hanging out in Philly as of a few days ago. Does that mean anything? We don't know, but on the court, Noel quietly improved his offensive production in 2015-16. Still, it’s clear that he needs to play center to provide his true value to a basketball team: rim protection. If you're looking at the numbers alone and wondering how Mason is 10 spots ahead of Neuvirth, then you're not considering the big picture. The way he played in the postseason may have left a sour taste, but don't forget how sweet the run up to the playoffs was. And, as previously mentioned, Mason will continue to battle for the starting role with Neuvirth. We'll make sure to adjust our rankings accordingly. Matthews struggled with drops at times in 2015, but the slot receiver was still the Eagles’ top pass-catcher and also came close to cracking 1,000 yards. The highlight of his season was a walk-off touchdown in Dallas. Matthews won’t have as many plays per game as he grew accustomed to in Chip Kelly’s offense, but he may get the chance to play outside a bit more under Doug Pederson. One thing is for certain, though: He doesn't lack for confidence. The numbers scream for Matthews to be ahead of Ertz, but it was fairly obvious that the young tight end wasn't 100 percent in the early part of the season. Once he caught fire -- and found a rhythm with Sam Bradford -- Ertz proved he belongs high on this list. Going forward, however, you can expect some flip-flopping between him and Matthews, largely dependent on how they gel with QB-of-the-future Carson Wentz. It will also be interesting to see if Doug Pederson's penchant for throwing to tight ends in Kansas City was a product of his system or of Alex Smith. But a five-year extension this offseason is a good indication of what to expect. Schenn had a breakout year in 2015-16, eclipsing his previous career-high point total by 12. He’s currently stuck in restricted free agency (and possible arbitration) with the Flyers, and there are legitimate reasons why this might be a tricky contract for Ron Hextall to get done. Still, we here at #PhillyRank like that Schenn has improved his scoring every year of his career. So do 97 percent of our readers, apparently.